I have been working on this challenge of word-craft seriously for about ten years, adding “author” and “playwright” to my eclectic list of careers: missionary, counselor, principal, minister, teacher, entrepreneur, software/graphics designer, and organizational architect. 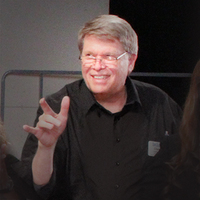 In addition to writing and my day-job building websites and publication graphics, I am active in two choral organizations. Current non-fiction projects include works in personal/spiritual growth and a practical guide to organization change. My fiction usually explores the humanity of people in crisis. I'm working on a collection of fictionalized Bible stories, a micro-fiction series called “Tragedies at Midnight” and a one-act play about elder dating. We’d love your help. Let us know what’s wrong with this preview of Keeper of the Watch by Kristen L. Jackson. We’d love your help. Let us know what’s wrong with this preview of Preaching to Empty Seats by Dr. C. Dexter Wise III. We’d love your help. Let us know what’s wrong with this preview of The Viscount's Son by Aderyn Wood. We’d love your help. Let us know what’s wrong with this preview of Magician's Heir by D. Bruce Cotton. We’d love your help. Let us know what’s wrong with this preview of Nobody Gets the Girl by James Maxey. We’d love your help. Let us know what’s wrong with this preview of Unhinged by Omarosa Manigault Newman. We’d love your help. Let us know what’s wrong with this preview of The Dark Prince by Emma V. Leech. Constantly was looking for a excuse to read this story. Can hardly sit still until I purchase the next book! We’d love your help. Let us know what’s wrong with this preview of Advent of the Magic Eater by Chamberlain Potts.